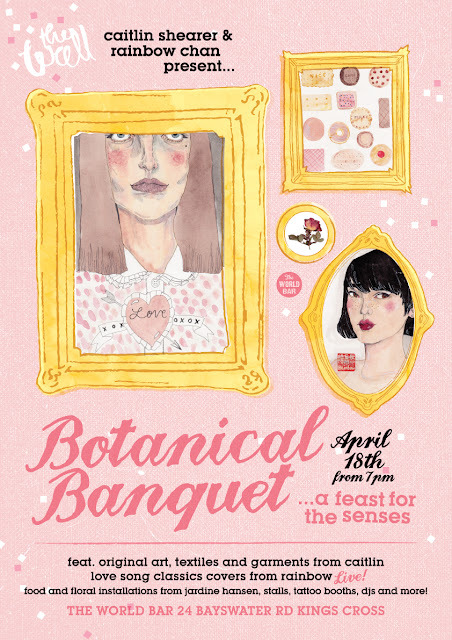 BOTANICAL BANQUET: A Feast for the Senses! Featuring artworks, and textile and garment design from Caitlin Shearer and a live, one-off love song covers set from Rainbow Chan. There will also be floral installations from Jardine Hansen, food and markets stalls, a temporary tattoo booth with designs by Caitlin, DJs, dancing, exclusive prints and EPs for sale, and more! 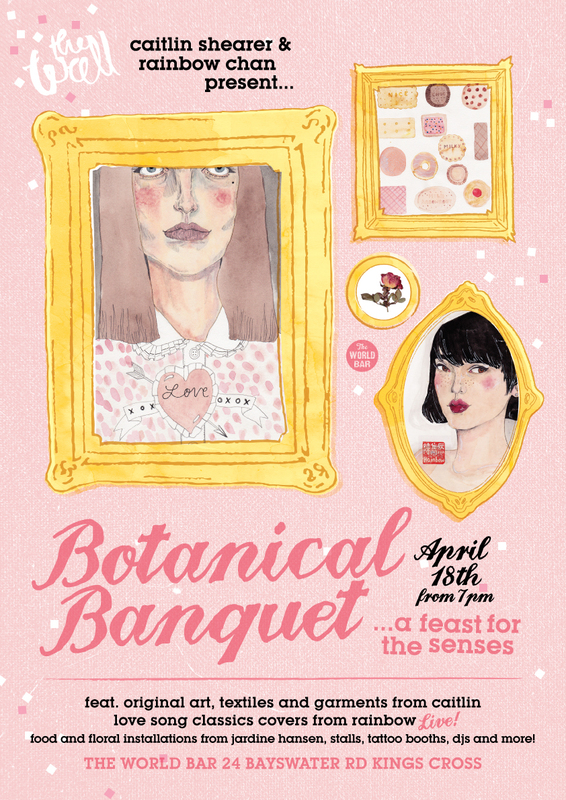 BOTANICAL BANQUET will be a unique collaborative experience between the artists, and an insight into their own little world. Come along! Caitlin Shearer is a freelance illustrator and textile designer working out of a bedroom studio in Sydney, Australia. Obsessions include: Drawing pictures, watercolour paints, Winona Ryder, Twin Peaks, pressed flowers, Ferragamo shoes, black dresses, lipstick, The wizard of Oz, Brocade, swans, the golden age of hollywood and biographies about decadent/intelligent/creative/crazy females. Rainbow Chan is a Sydney solo artist with a love for story-telling. An eclectic mix of electronic and acoustic textures, Chan's songs are delicately-crafted gems. Live loops are created with music-boxes, thumb-pianos and vintage toys. Lilting guitar is matched with 8-bit keyboards, distorted beats and glockenspiels. Experimentation is interlaced with the other-worldly charm of her voice. With diverse influences ranging from Björk to Steve Reich, from Chopin to guilty pleasure Justin Timberlake, Rainbow Chan is always looking for ways to play with sound and narrative. Sweet, dark and glitchy, it's forward-thinking pop embedded in the nostalgic imagination. p.s. Be a darling and RSVP here + Invite your friends! oh jeez this sounds AMAZING!!! WHY am I on the other side of the globe?? I'm sending the invite to all my sydney friends via FB though, so that I may live vicariously through them!! !